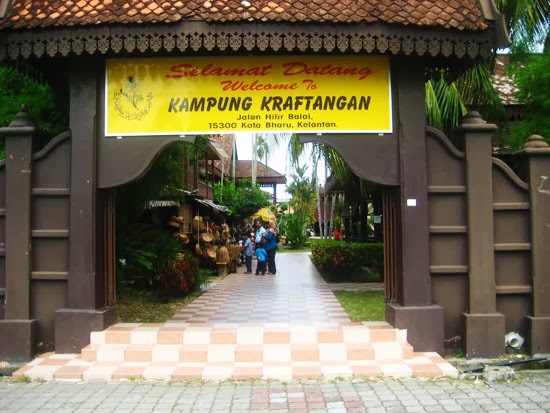 Must Visit Places in Kelantan! Travel back in time when people still go to the market for their daily groceries in rickety trishaws, make kuih muih from scratch without preservatives and have time for intricate handicrafts for the entertainment of the entire family. as they live harmoniously with each other and those of different ethnics. 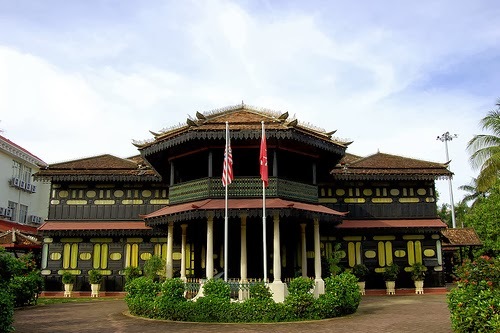 Kelantan has been linked to ancient history documents from China, Khmer Empire, Sri Vijaya , Majapahit and Siam. And being direct neighbors to Thailand, the Kelantan people have absorbed the many Thai customs and traditions that help to make the state's culture distinct from those of other states of Malaysia. Have you met a local from Kelantan before? Listen carefully to their accent or dialect, its almost musical! for inviting me to be a part of the inaugural flight to Kota Bharu! Now let me show you what I have experienced in this truly unique destination. The first thing i did was to sit in a TRISHAW! I love the fact that almost all the trishaws are personally decorated by their owners and most of the trishaw drivers have been operating for more than 20 years! I definitely felt safe and it was so FUN! Its like riding in a Tuk-tuk in Thailand or an Auto in India! I swear I'm a really simple person, I was so happy sitting in the trishaw! Definitely better than sightseeing from a car or a bus, in a trishaw i can view the town at a slower pace. Okay, straight to the important part! as most of it is situated closely together. 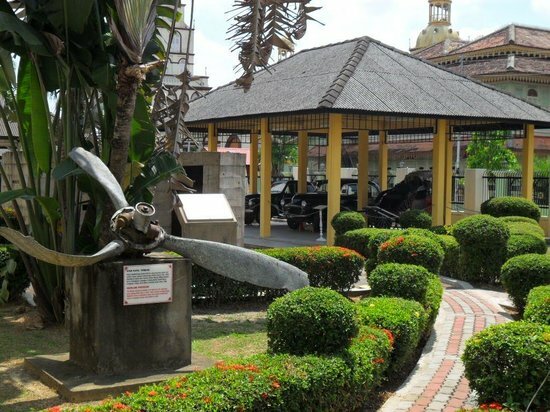 Kota Bharu is like a history buff's treasure island! So,so much to discover! An excellent place to learn about the World War 2 and its impact on Kelantan. Featuring collections of documents, pictures and military paraphernalia from the Japanese Occupation. 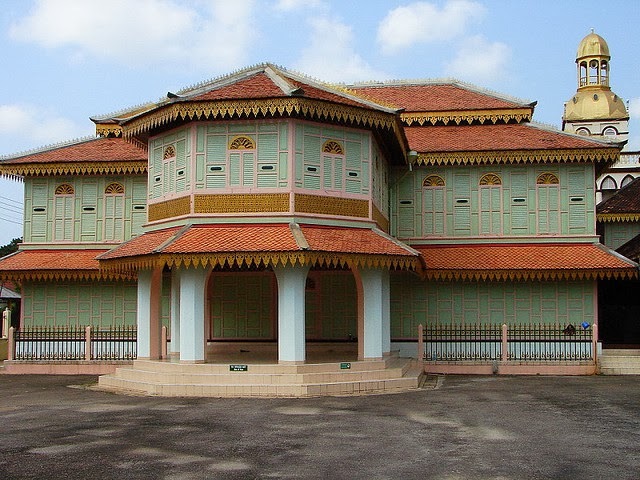 Once well known as Serambi Mekah or Veranda to Mecca , it now displays a small collection of photographs and artifacts relating to the history of Islam in the state. Be enthralled by the gradeur of the Royal Malay customs and traditions with their collection of royal engagements, weddings, births and other ceremonial occasions. 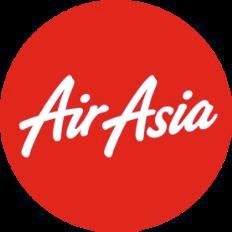 Great place to begin or end your tour of Kota Bharu. Browse endless unique handicrafts ad souvenirs or eve watch cultural performances! Admission to the Craft Village is free, but not the entry to the museum. Feeling so at peace immediately after stepping out of the bus and seeing this grand temple. Look at the detailed sculptures, intricate designs and vibrantly colored! A mosque or a building from China? Its both! Pop over to the Cultural Centre to witness the real life performances by the Kelantan traditional artists. As they sing and dance enthusiastically and passionately, you cant help but clap along or be mesmerized at their colorful costumes! One of my favourite places that we visited - the Shadow play! Or locally known as Wayang Kulit ! Here, you can sign up for classes where the last few talented artisans teach you the real way of making these puppets used for the wayang kulit. A dying local art that i hope will somehow be preserved for our future generations to enjoy. During a wayang kulit performance, the master storyteller or 'Tok Dalang' conducts the show from behind the screen by reciting the tale with appropriate sounds and movements. and then grinding it when its dry till it resembles meat floss. Fragrant and oh-so-yummy meat floss/serunding is made here. Check out their huge kuali for cooking and the machine that grindsand pull the meat slowly till it is floss. Getting there is kinda tricky but, all the locals will help you get a boat to cross the river to Kampung Laut where a long row of houses are dedicated to the making of these yummy delicacy! Kelantan is jam-packed with local art talents! Every single silver item here is handmade! Behind their showroom is their workshop where you can custom order your silverwares and accessories. Owned and operated by a family, Min House Camp boasts more than just organic honey but also, FIREFLY SIGHTSEEING! The riverbank is dusted with fairy lights! Nature's very own Christmas decoration! Unfortunately, we all weren't able to capture the beauty on camera but, see it for yourself and you will realize that nothing is more beautiful than it being seen in real life instead of digital pictures. The traditionally renowned songket and weaving company in Kelantan sells Songket, Batik and local handicrafts. Although famous and very much in-demand, they maintain their reasonable prices and was awarded Fair Price Shop Awards by the Ministry Of Domestic Trade & Consumer Affair. So, go ballistic with shopping here with their value for money products, or you can go downstairs where really traditional songkets are slowly made by these elderly women. Proud of their skills that have been passed down for generations, these ladies showed off their weaving skills with their trusty wooden frame that suspends hundreds of cotton and silk threads for them to weave or hook! One of the last few Master wau-makers, Pak Shafie has more than 30 years expertise. With utmost focus and precision, he carves pieces of colorful paper according to various designs, chooses only the best pieces of bamboo to make the frame of the giant kite. A process which can go on for months, Pak Shafie ensures each Wau is a work of art from the heart - a work of heart. to not only witness it like me but if you are blessed with more time, learn this work of heart. Where to Stay? and What to eat?